Nicole's Needlework: Class Project Stitching Finished! 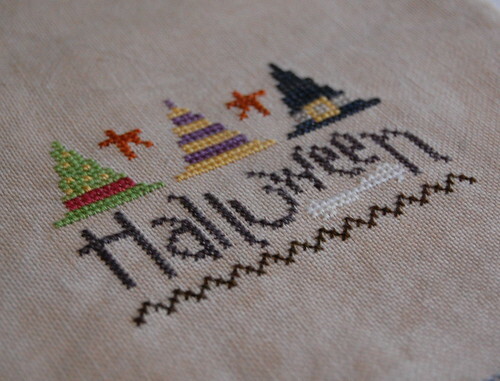 After I finished that up I decided to get back to the correct holiday of the season and stitch "Halloween Sampler" by Lizzie Kate. It is so pretty! Over 1 is a pain, but it is soooo pretty when complete! You have made a beautiful piece. I love your colors! Beautiful class project - can wait to see it after class. I'm not keen on stitching over one either, so I can understand where you're coming from, but it really is worth it, your class piece is gorgeous! Halloween is looking cute too. I agree about the over one. I love the look, but it makes my eyes crazy, even with the magnifier. I have a project that I barely got started on that was over one on 40 count gauze. It's a Maureen Appleton design. She likes over one stitching. I'll have to get it out and post a picture. I'm not a fan of over one stitching either. The class project turned out great ! 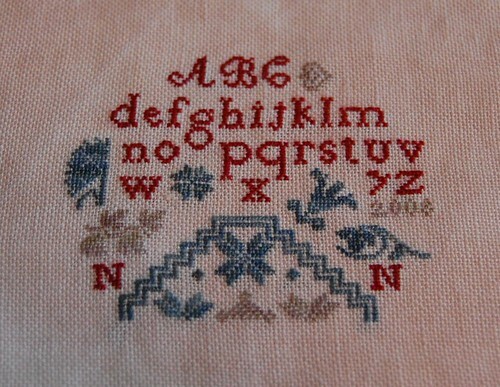 Your class stitching turned out FABULOUS even if it was a bit tedious for you to do over-one. And I just love your Halloween project! Nicole, your class project is just wonderful! 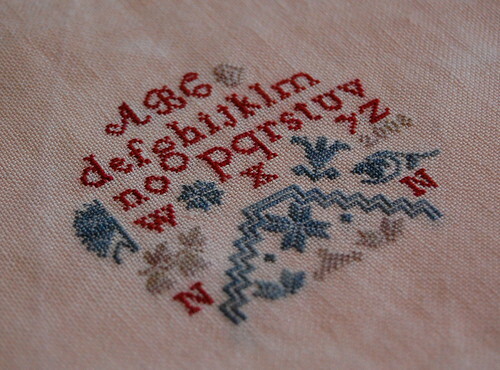 I know the 1 over 1 stitching is very difficult for eyes, but it looks reeally pretty! I also love its colors. Hard or not, your class project looks fabulous Nicole! Congrats on your challenge. The colours look terrific too. The Halloween Sampler is looking good also. I like the fabric you're doing it on. I love your class project. Nice colours, great design!